For press queries in French or English, contact Alain Wagner at alain.wagner@hotmail.fr . Please send press queries for interviews in German, Danish or other languages to brusselsprocess@gmail.com. 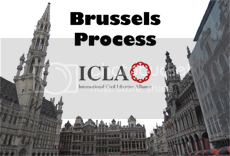 ICLA spokespersons are available for interviews in English, French, German, Danish, and other languages. 9 July 2012, Brussels Belgium: On 9 July, the International Civil Liberties Alliance presented an International Human Rights and Freedom of Speech Conference in the European Parliament in Brussels. Over 100 people from numerous, countries, cultures, and backgrounds took part in this milestone event at which Lars Hedegaard of the Danish Free Press Society received the “Defender of Freedom” award. The conference was organised in response to the Organisation of Islamic Cooperation (OIC)’s Istanbul Process, which seeks to institute a global blasphemy law that would ban freedom of expression under sharia doctrine worldwide. Many governments are actively aiding the Istanbul Process, rather than opposing it as they should to preserve the liberties of their citizens. The European Union’s offer to host the next meeting of the OIC’s Istanbul Process shows that organization’s willingness to impose severe restrictions on traditional rights and freedoms of citizens within the European Union. The principal purpose of the International Human Rights and Freedom of Speech Conference was to encourage an open and fact-based public debate on these issues, and to provide policy guidance for political leaders, especially those who themselves are raising the alarm over the OIC’s totalitarian sharia doctrines against free expression, civil liberties, women’s rights, homosexual rights and religious freedom. The highlight of the conference was the formal presentation of the Defender of Freedom Award by Canadian author Mark Steyn to Lars Hedegaard, founder of the Danish Free Press Society (Trykkefrihedsselskabet) and the International Free Press Society. The principal outcome of ICLA’s 9 July Conference in the European Parliament was the “Brussels Declaration to Safeguard Individual Liberties and Human Rights.” That Declaration describes and launches a systematic ‘Brussels Process,’ designed to stimulate public debate on the conflict between sharia and liberty; to provide a counterweight to the efforts of the OIC to impose blasphemy laws in Europe and other countries; to re-establish standards of good governance and reasonable foreign relations based on the UN Declaration of Human Rights and national constitutions; and to reject the Cairo Declaration on Human Rights in Islam as a basis for any discussions on human rights and civil liberties. Working Groups for the Brussels Process were organized to develop legislative initiatives and briefings for policymakers and the media, in order to work to implement the Brussels Process as a moderate and prudent approach to protect free expression and human rights. The Brussels Declaration was developed with ongoing consultation with legislators in several countries. The Conference was attended by participants from eighteen countries including Austria, Belgium, Canada, Denmark, Egypt, Finland, France, Germany, Ireland, Italy, Netherlands, Norway, Poland, Sweden, Switzerland, Syria, UK, and the USA. 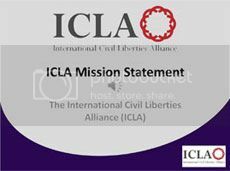 The International Civil Liberties Alliance (ICLA) is a human rights organisation dedicated, in the spirit of classical liberalism, to protecting democracy, freedom and individual liberties from religious and political doctrines that oppose those rights and liberties. ICLA does so through its voluntary members’ work to endorse, coordinate and promote educational and advocacy campaigns, legislative initiatives and changes in policies of governments and civil society.